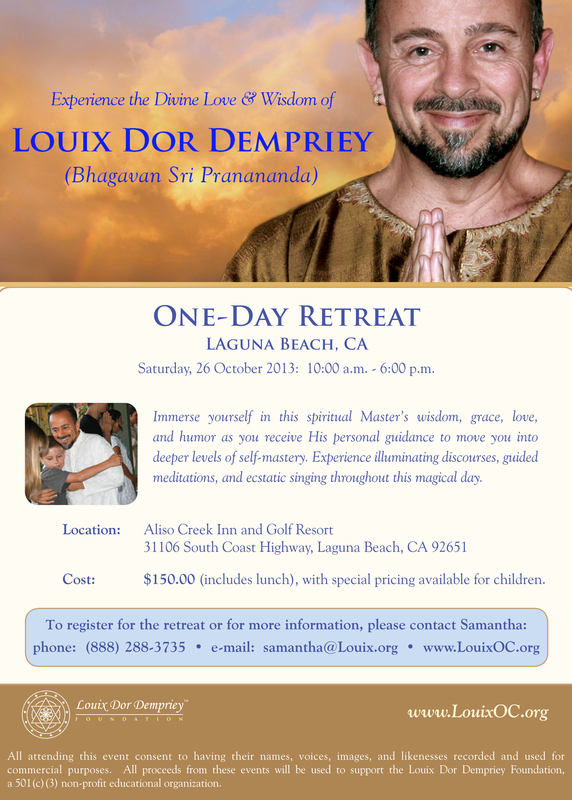 Date & Time: Saturday, 26 Oct 2013, 10:00 a.m. – 6:00 p.m.
As a condition of participation in the One-Day Retreat on 26 October 2013 (“Retreat”), you are required to complete this Registration Form (separate forms must be completed for each adult and each child attending) and mail it to the address below, along with the registration fee of $150.00 per adult ($75 of which constitutes the non-refundable deposit), or you can register online at www.LouixOC.org. Once registered, you will receive a welcome packet along with additional forms to complete, which will be e-mailed (or mailed) to you, including a Liability Waiver, Recording Release, and Medical Information Form, all of which must be completed as a condition of participation in the Retreat. There will be no refunds after 26 September 2013 for any reason. Refunds may take up to 45 days to be issued.